Comments on "On the Street.... 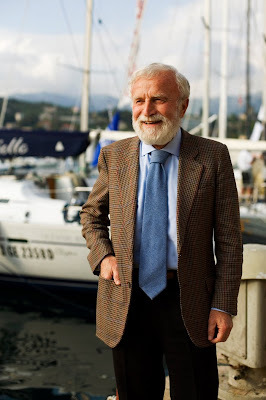 The Italian Tie Knot, Hyeres"
Simpatico! And what a beautiful blue tie! I like this guy. He's smiling, and has a Hemingway beard. And the background is great too! Very Newport, RI. This is true style! Great style. Great color combination. Very elegant gentleman. I hate it! I think the jacket's fantastic, but the knot just looks too unwieldy IM(NSH)O. I think the bulk of the jacket would be better offset by a more subtle knot. He reminds me of my 9th grade history teacher, only without the bow tie. He's very distinguished and the tie is just perfect. It's a bit subdued as it's blending with his blue shirt, but it makes a bold statement nonetheless. And his beard! Absolutely charming. And against an excellent backdrop w/ the docks. Brilliant. Fantastic!!! Great style, yet a totally approachable looking man. Hey... he looks like a cross between a fisherman and my old philosophy professor. I like the tie, though I cannot quite see its texture. Looks real and obviously he himself is intimate with this look- as opposed to something that you hastily picked up as a trend. And Scott- I wanted to thank you for this wonderful blog. I'm always at my computer, and mostly in quite a drab enviornment, and your blog makes my breaks truly delightful and inspiring. Everyone's soul needs beauty- and if it's living breathing beauty on the streets, even better. Can someone explain to me the male obsession with tie knots?? Is it the female equivalent of cup size or skirt length?? For the record i know i don't like that knot or that tie, it's big and fat and looks as if it's about to fall apart any minute. Sart - maybe you caould help out and invite your correpondants to nominate 'greatest ties tied of our times' or something'? The Italian Tie Knot looks the same as the standard American tie knot. Is it different? He looks like the worlds most interesting man, dos equis. Very joyful and pleasant. I love the way that brown and blue work together. Nice pairing. And, the big knot works so well with a spread collar. Very nicely done. One minor suggestion. Your tie is too long. Knot the necktie so that the bottom point falls on your belt buckle. This way it won't interfere when you are buttoning your jacket and it will give a neater look when you are seated. Nice. Picks up the blue in his jacket very well. I think the knot may be more British rather than Italian since they favour large knots. I think his knot is too large and it ruins a nice look. It particularly dwarfs the collar of his shirt. The sport coat however, is great. Brilliant fabric. Gun club is the design, if I'm not mistaken. He seems like a genuinely nice gent. I picture him more in a captains suit, all bright white with that great hat. The Admiral look. This does not drip style to me, but that tie would catch any gravy that did. Nice guy, normal outfit, day in the life. Thank You. A gentleman and a scholar! True love. Love the combination of blue and brown, though the tie seems a little wide to me. As mentioned by others, he looks distinguished yet approachable, and he looks as though he belongs in front of the boats. A retired sea captain perhaps? Anytime is great when someone gets dressed with a little care. So who cares if the ties a bit wide, a bit long, and a bit heavy, or the collar a bit to short (only for that tie) What matters is a smile, sartorial components, (I have an Isaia jacket in that fabric)and a picture on Sartorialist. Not a bad day indeed. He reminds me of one of my old college professors...I don't think that is him though... Great shot! your photos make life look...brighter. To anonymous 3:53PM: Awesome,that's the spirit! Who's looking for perfection? Such a thing does not exist. Only God is perfect. Were humans, tha's all and that's great. That jacket, tie and shirt go together perfectly. I wish you had a really close up shot of that tie.It's such a beautiful blue. Blue tone-on-tone is a safe bet. The shape of the knot is mostly determined from the width of the tie, I think. He has likely made the knot from the upper more narrow portion of the tie (thereby explaining why it appears long). Anyways, Mr. Ernesto Hemingway looks good. Italians use much more the french collar and tie a much larger knot than Americans. He is channelling Aristotle! Good call. Scott your pictures are brilliant. I would like a little advice though; to create the fabulous photos, the slight blurring in the background and all the other elements in your photos that seem to create portraits with all the magnificence of an oil painting, do you need to use an SLR camera? I have a pretty good 8mp digital camera but I can't seem to get the thing to produce anything more than a 'snapshot'. I love this! His smile is adorable and so heart-warming. My professor dresses like him all the time: very simple but eyecatching with an interesting tie/shirt and color combination. I always want to take a picture of him and send it in. Have you been to Saint-Tropez? Ooh no, can't be doing with that 2" below the belt look. Having said that, I wear jeans and t-shirts most days, so may not be in a position to comment. How can a tie reveal so much about personality? The Whole outfit just looks so CUTE! Love it ! There is 9 famous tie knots. Tell me what do you think about.